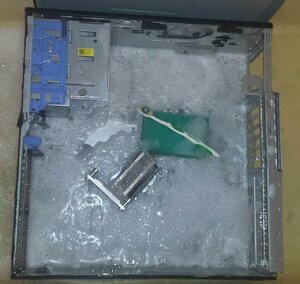 Dell X58 Cleaning Time. Should get a new HSF. Discussion in 'Overclocking & Cooling' started by surlyroad, Feb 9, 2019. I have a Dell T3500 with the beefier HS, and X5672. 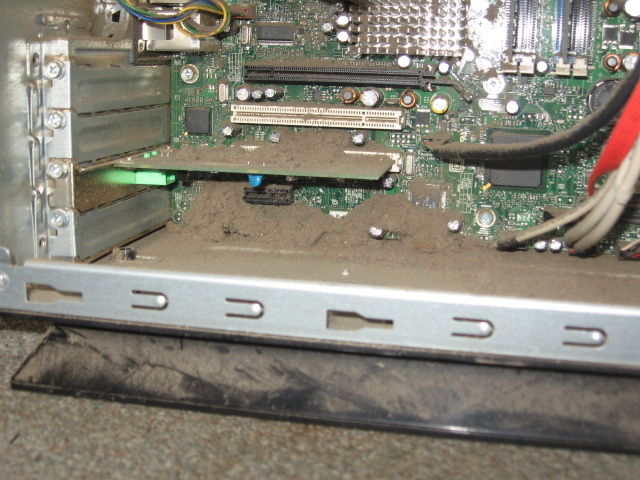 The time is coming for me to give the computer a good cleaning, as I'm a smoker. Keeping in mind that I really don't have much money to play with, would this be good? Again, the cheaper the better. But since the T3500 HS is passive, I guess anything active would be better. Makeup brushes and a shop vac would be cheaper than buying a new HSF unless your experiencing thermal issues. Give it a good dusting and sucking once a month, but if your set on replacing the passive unit, than yes, that will be a fine choice as long as there is no clearance issues. Are you sure the mounting holes are the same in that Dell as a standard LGA1366 spacing? I've used a 212+ with my X58 boards and they work great, however, I'm just not sure if Dell did anything wacky/proprietary with the HSF. I've done around 3, 212 HSF replacements in T3500's. They fit fine, the only issues I've seen are if you are using RAM with super tall sinks, but that can be on any build with this HSF. You can even use the OEM backplate if you desire. surlyroad and kirbyrj like this. Well acquainted with these T35/5500 as you can see by my signature. If it were me, I would not bother with a big aftermarket sink. The Dell unit is actually pretty good. Some premium TIM along with a decent 80mm fan (not low speed case fan) mounted directly to the sink in a 'pull configuration' should do nicely. My W3680 at 4.0ghz , temps rarely break 50-c during heavy gaming. Hottest I can make them is about 55-c running Prime95 small FFT's. As for a good cleaning. How far do you want to go? Only solution I have found for a smoker's box is completely strip the case and wash with dish soap. Next part might seem gross ... these being used Workstations no telling where they have been. Even after employing shop vac and air compressor the soap always releases more that has worked it's way between the double wall panels. Who's hair and filth is this? Just a fraction what came out. surlyroad, kirbyrj and Susquehannock like this. Yes indeed. Quite an improvement there. Home PCs are usually worse. One of the nastiest I have seen was a few months back. My significant other's son-in-law passed away and her family asked me to pull pics and info from an old p4 era HP box they found. Long story short ... it had never been cleaned. 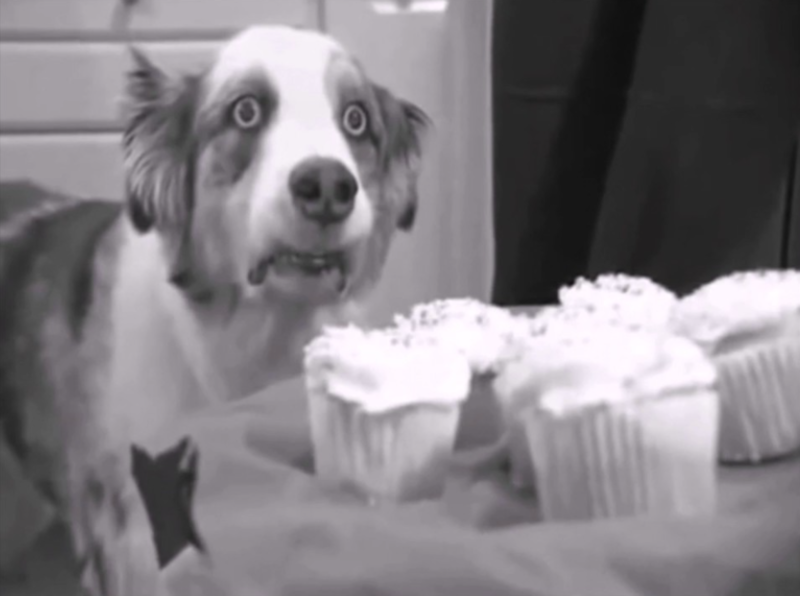 Then it was discarded in a dank basement for several years where at some point a mouse found it's way in and died. Slime, bones, fur, and dried maggots. Never brought it inside. Just pulled the HDD, RAM, and CPU, then chucked the rest. GSDragoon, surlyroad and CAD4466HK like this. Susquehannock is right, a good quality 80mm fan carefully attached to the Dell heatsink is all you need to keep these units cool. My X5667 never gets above 50-c ever. https://www.techpowerup.com/forums/threads/dell-workstation-owners-club.243124/ Here's a great resource. Susquehannock, the box was very clean when I got it. But, like I said earlier, I'm a smoker. I'm not looking to go nuts with the cleaning, but I'm going to have to remove the MoBo to fix the wiring mess I have, so it will be a pretty thorough cleaning. How do you get the other side panel off? You don't. It's part of the case. Mobo out is a good time to run a wire behind there for the CPU fan mod (here) ... if you plan to go that way. If not already, you might consider downloading the T3500 service manual (here. Lots of good info. 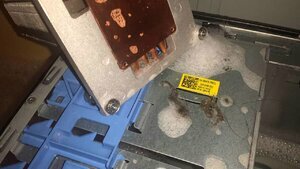 Is there any reason not to use the OEM backplate? Also, my RAM doesn't have any sinks, so clearance should be fine. Only if you feel like pulling the motherboard. Hey there. I went ahead and ordered a CM Hyper 212 Evo, and some Noctua NT-H1 paste. Yep, gonna pull the MoBo for the cleaning and cable management. Thanks for the help, and the links! Was wondering this before. How do you fit CM Hyper 212 Evo in the Dell T3500 case? Product dimensions show height of 6.3" (159 mm). Distance from socket to side panel is slightly less than 6". And that does not account for an inch or more for the swing out HDD panel. I looked up images of the T3500 because now you got me worried that the OP might do something he regrets. I didn't remember it having swing out HDD panel in the ones that I worked on. All the ones I found did have them except one. I got all three from a carpet warehouse at the same time, none had the swing out panel, all drives were in 3.5 bays w/ brackets. And the cases were all black, not black and silver, and not BTX....now I'm doubting myself they were even T3500's at all. EDIT: Did some legwork and contacted the company, spoke with the systems manager that hired me and asked if they still had them kicking around. They had none in service, but they still had an invoice for the purchase and it appears that they were in fact Dell T3xx Poweredges!!!! I feel like quite the fool now. OP I hope you didn't buy that HSF, return it if you did, unless your willing to drop that mobo in another case. I apologize for misleading you and giving out false information. Susquehannock, thanks for [H]fact checking me and calling me out on this, my memory failed me and there is too much fud on this site to have any more spread. Yeah. It won't fit. Not even close. The blame is all on me. I have seen some put the mobo and some other components in the dishwasher to get them a deep clean. For at least a year I've been wanting a Hyper 212 Evo. I've been under the impression for a long time that it would fit. Susquehannock, I guess this behemoth is going back to Amazon. I'm not sure how much that's going to end up costing me. With modding the Dell U016F HS with an 80 mm fan, can you recommend a good fan? And I'm not sure where it could be plugged in. All you did was ask for advice, and was given the wrong information in return, the fault lies with me and for that I apologize. This is true. If I was dealing with my own build, but a clients? I wouldn't take the chance, knowing my luck. I put a fan on the beefier heatsink. Nothing else fits without mods that I know of. Me too. Have been watching the X58 overclocking thread and envied how 212 Evo fits into those aftermarket cases. Any 80x25mm fan with good speed and CFM numbers with smaller sized center hub should do. Installed these classic Sunnon that I had lying around into several T3500s. Decent compromise between airflow and noise levels. Cannot hear it once the side panel is on. 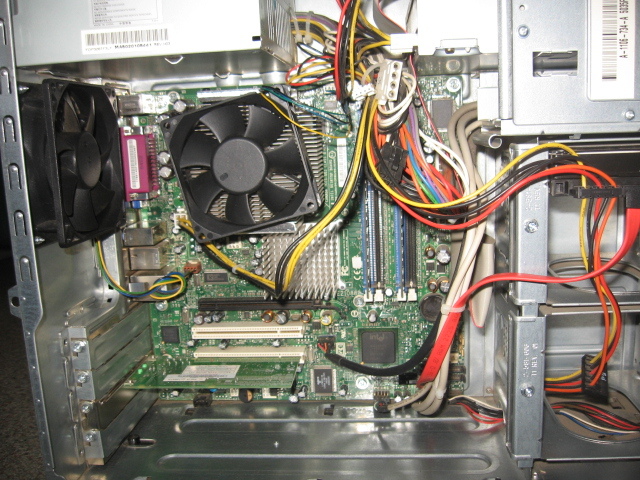 As for plugging it in, not many options for powering accessories with the Dell PSU except the 4-pin molex and floppy connectors on the wiring harness. 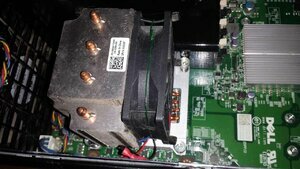 What I do is cut ground & 12-v wires on the floppy plug, attach bullet connectors for easy removal later, then run wires behind board to the fan. Alternatively, you could use a 4-pin molex adapter. I used an Evercool molex adapter EC-DF003 for two 12V 80mm Arctic F8 Silent fans, one for the CPU cooler and one for the back case exhaust along with an Noctua 5V 60mm that I attached to the Northbridge heatsink. surlyroad and Susquehannock like this. 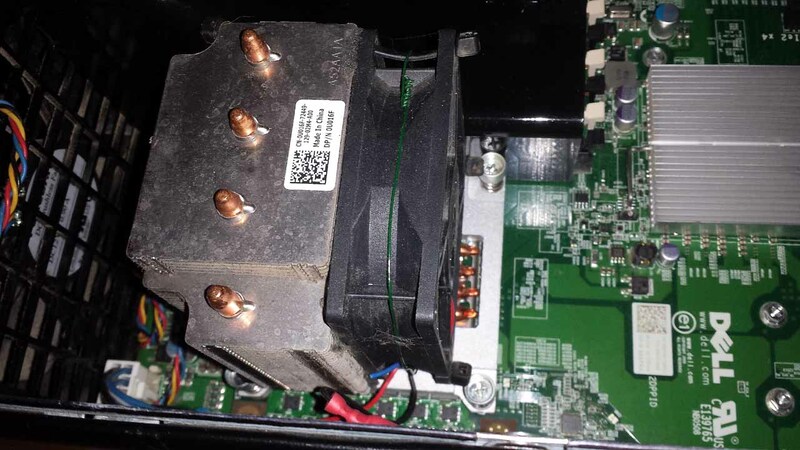 The Dell 500W PSU that came with my T3500 up and died. I'm using a Corsair CX430. If you smoke inside next to your pc then you deserve no help....enjoy your disgusting filthy hardware which should be against the law to resell. Smoke outside for fucks sake! Would I just connect it to a Molex connector, or is there a nearby 3pin header on the MoBo? I guess PWM is out of the question, but that's fine. Gonna return the 212 EVO, and just strap a fan to the existing HS. Still going to do the thorough cleaning/cable management. Hi there. I'm not trying to sell anything to anybody. I haven't blamed anybody for my computer being funkified by my smoking. I don't have anybody breathing secondhand smoke from me. I really don't understand why you folks are coming down so hard on me. Again, I wasn't trying to sell anything. And if I were selling anything, I would make it quite clear that the goods were from a smoking household. 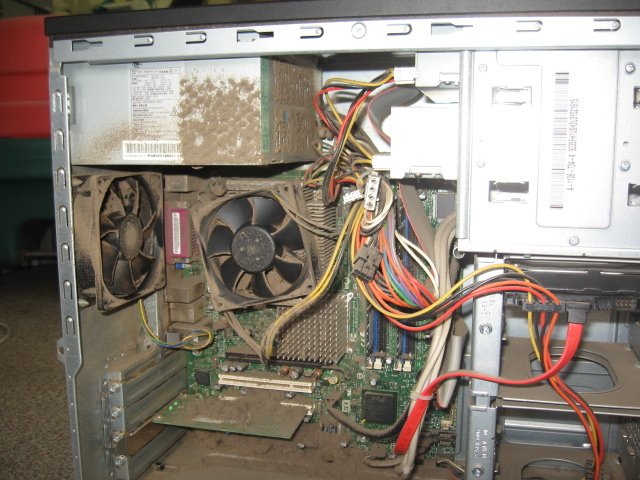 I'm going to give my computer a good cleaning soon. I know it's going to be gross. But that's my problem. Whatever. If you guys want to keep digging at me, that's fine. I don't understand the motivation behind it. I don't enjoy being attacked, but I'm thick-skinned. My post was in a joking nature, nothing else. In my opinion, the other comment was pretty rude, but I'm too new here to have a rebuttal. That's the fan. No standard headers on the mobo. In your situation an adapter like this would work. No PWM or speed sensing. Just flat out 12-volt speed.